1.1.1 The congregation is a charity (Charity No SC035048) and a congregation of the Church of Scotland (Congregation No 452385). Its charitable purpose is the advancement of religion. Like all charities, the congregation must be able to pass the public benefit test by demonstrating that its activities continue to be consistent with its charitable objects. The members of the Kirk Session and the Congregational Board are the charity trustees. 1.1.2 Membership of the congregation is open to anyone who has or wishes to profess their faith in God and to work for the advancement of Christ’s Kingdom throughout the world. Visitors are always welcome. The Church of Scotland acknowledges a distinctive call and duty to bring the ordinances of religion to the people in every parish of Scotland through a territorial ministry. It co-operates with other churches in various ecumenical bodies in Scotland and beyond. 1.1.3 The congregation has approximately 370 members and provides a service of worship every Sunday. The Sunday Club meets during the service and provides child-friendly worship and activities. The Forum, for children in P4-7 and the Youth Group for young people of secondary school age meet every second week and these groups are run by dedicated parents and friends. The Boys Brigade, although not an integral part of the congregation, is sponsored and supervised by it and has an Anchor Boys section for younger boys, a busy Junior Section and a Company Section for the older boys. All 3 groups meet once per week during term time. The Church Choir meets for practices once a month on Saturdays and the Guild hold monthly meetings, both very sociable gatherings. During the year the minister organises “explorers” meetings for new members and study groups. The Church is run by the Session and the Board, both groups meeting at least four times a year and, at times, extra training sessions are run. 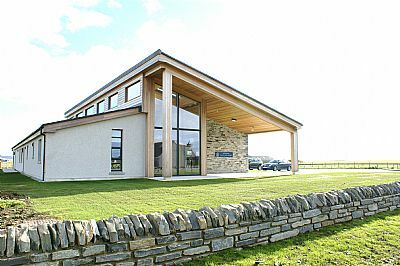 2.1.1 The Church of Scotland Congregation of Birsay, Harray and Sandwick (established October 2000) is a major community group in the north-west of the Orkney Mainland, an intensive farming area centred around the village of Dounby. 2.1.2 The congregation has built its new Milestone Community Church in Dounby, where no such community facility previously existed. The design of the building has community use as its principal objective. By thus strengthening the local farming community, the project is expected indirectly to encourage new entrants into farming and future generations to remain in farming. 2.2 Our visions for the building……. • Three are stronger than one—we, the now-united former parishes of Birsay, Harray and Sandwick, have built a new community facility in the centre of our parishes to serve a new century. • Our communities have lived through a century of great change. Thus the church needs to change to be fit for its purpose. The purpose of the church is to serve its communities in its spiritual, social and physical needs. • As a united congregation of three parishes we have had the vision to provide one modern, accessible, eco-friendly and multi-purpose centre to provide a space for all people and for any purpose. 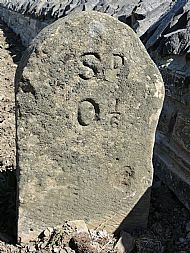 • There is an ancient milestone by the roadside at th e site of our new building. A milestone is a great marker on a journey and a symbol for us to provide a space for people to mark milestones in their life (e.g. births, marriages and deaths). It will also make room for people to renew or rediscover their spiritual life in a highly material world. 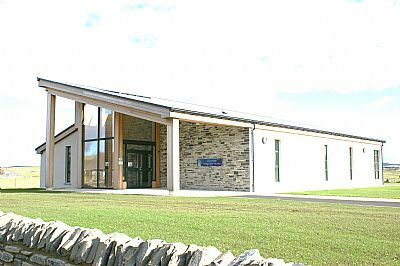 To make the congregation an essential part of the community of the West Mainland of Orkney through the building and operation of its new community facility in Dounby. 2.4.1 Until the 1990s, there were three separate Church of Scotland congregations in the north-west mainland of Orkney – Birsay, Harray and Sandwick – each with its own church buildings dating from the 19th century and in varying states of decay. 2.4.2 By October 2000, the three congregations had united into one, with one minister and one administration of Kirk Session and Congregational Board. At that time, all the Manses were sold and a new Manse was constructed near Dounby. Dounby is the village at the centre of the three former parishes, although none of the churches were situated there. 2.4.3 The old church buildings were not comfortable to use and were way below modern expectations for any sort of community use. None of them were user-friendly for the disabled. Although services were held in each church by rotation each Sunday, it soon became clear that such an arrangement was hindering the development of the congregation both internally and externally. 2.4.4 It was universally accepted that the congregation should reduce to one building and so the decision had to be made to create an entirely new building in the central location of Dounby. A new community facility would be created, improving on the previous facilities beyond all recognition and providing a building where various other diverse activities could take place in order that the use of the building and its resources be fully maximised by the church and by the community any and every day of the week. The facility would offer Information Technology features to all users and would constitute a huge improvement on the building energy efficiency of the three former churches. 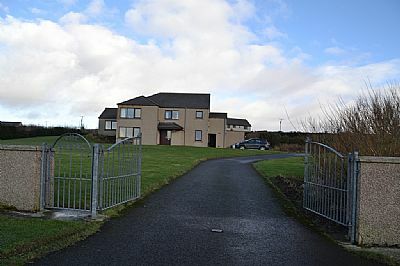 2.4.6 A site was identified on the edge of Dounby, adjacent to Smiddybrae House, the new care facility run by the Orkney Islands Council, and the owner agreed to sell. 2.4.7 During 2008, the old churches in Sandwick (Quoyloo) and Birsay (Twatt) were put on the open market and sold for a combined figure in excess of the total of the individual valuations. St Michael’s Church in Harray was retained for congregational use until the new building was ready. It in turn is to be sold, and it was recently advertised on the open market. 2.5.1 Dounby is an expanding village with a school, supermarket, butcher, hairdresser, hotel, post office, building contractors, undertaker,doctor’s surgery, pharmacy and Care Home. Various groups meet in the Dounby Centre which is an integral part of the primary school. The more intimate size, flexibility and nature of the spaces and facilities available in our new building contrast with, and complement, the much larger spaces available in the Dounby Centre. 2.5.2 Although owned by the church, the building is run by a dedicated Management Committee and available, subject to booking, without prejudice for any uses that benefit the wider rural community whenever it is required. This is intentional, entirely fulfilling the modern concept of "church", whereby church buildings are seen very much as community buildings in use throughout the week and not just for an hour on Sundays, with an outward-going approach and openness towards the whole local community. In the past, churches have been seen to have only one exclusive use whilst the community (without realising that the church was privately funded) still expected them to exist for large events such as funerals (whether or not the deceased was a church member). 2.5.3 The design of the building has community use as its principal objective. The space used for church is entirely flexible with loose, comfortable seating, enabling it to be used for a variety of functions throughout the week. It seats up to 150 with the option (by opening a sliding partition) of adding the adjacent hall (capacity 50). There is also a smaller meeting room, a social area and adjoining kitchen facilities adequate for sizeable events. Extensive use of glass gives it an open and welcoming feel while also including many eco-friendly features. 2.5.4 Construction commenced in June 2011 and the building was opened for use on 1 June 2012. All of the congregation's available resources were committed to the project, including pledges made by members of the congregation. 2.6.1 By its very nature and design, the building is relatively cheap to run and is certainly more efficient than the congregation’s previous buildings. In addition to the congregation contributing towards the running costs of the building, outside user groups are asked to pay a hire charge towards running costs but this is within the not-for-profit operations of the charity. 2.6.2 Special times of year or occasions are marked by special services and events, birthdays, weddings and funerals being part of this group of activities. These are often followed by social refreshments and the building’s kitchen facilities are ideal for such functions. It is our aim to provide an accessible space for all age groups and physical abilities without prejudice. 2.6.4 The congregation has appointed a management committee to operate the building. Although it is part of the charity's overall activities, the operation of the building is effectively autonomous and committee members from outside the congregation have been enlisted. The committee consists of 7 members with at least 3 being from outside the congregation. The committee’s effective autonomy strongly influences the facility’s identity as a community building rather than the perception of it being a traditional church. It is the committee's intention to operate the building in a financially and socially sustainable manner. Any surpluses from the running of the building will solely be used in the future operation of the building in order to contribute to its sustainability. 2.6.6 The Church of Scotland is already engaged in providing community facilities that also serve as worship spaces. A particularly good example in Orkney is the Kirkwall East congregation who own and operate their King Street Halls in exactly this way. 3.1 The historic parishes of Birsay, Harray and Sandwick are situated in the northwest mainland of Orkney. They have very different characteristics – Sandwick and Birsay being exposed to the full force of the Atlantic Ocean, which has cut the gentle westward slope of the hills into perpendicular and overhanging cliffs. Harray, however, is the only inland parish in Orkney. Historically, Harray people were allowed to go to the Sandwick shore to gather “ebb-meat” (shellfish – which was in those days an important part of their diet). In return the Sandwick folk were given a part of the Harray hill from which to cut peats, another valuable commodity, when the peat fire was the centre of family life. 3.2 The various primary schools in the three parishes were amalgamated into one primary school in Dounby during the 1970s in what was then a new building. This was extended in the late 1990s with the building of the annex known as the Dounby Centre (see above). 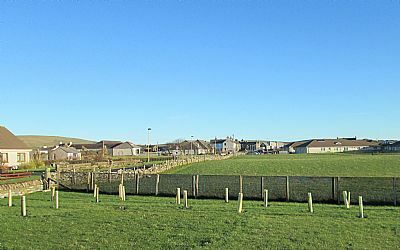 The Dounby School is one of the primary schools in the West Mainland which feed into Stromness Academy, a secondary school with approximately 450 pupils situated in a new building on the outskirts of Orkney’s second town, some 10 miles distant from Dounby. It has a high record of achievement sending many pupils away to further education in the south or Orkney College in Kirkwall, now an integral part of the University of the Highlands and Islands. 3.3 As farming is the main way of life in the three parishes, an important event in Dounby’s calendar is the Dounby Show held in early August where farmers come to show their pride of stock. To quote George Mackay Brown: “Here the creatures of the earth, animals, fowls and folk appear at their most splendid and festive. Beside the huge black bulls at the wall beside the pens of tinted sheep, the goats and caroling cockerels and the patient horses, we lingered out the afternoon talking to this friend and that and I ended as always among a throng of friends”. A horticultural and industrial show is held on the same day in the Dounby Centre. 3.4 Although their background is a rural community, many people commute to work to Kirkwall or Stromness and a car is a necessity for most Orcadians. All roads are well-maintained and are kept clear in the winter except if the weather is particularly and unusually severe. 3.5 All three parishes have their own small shops and community centres where many activities are held – whist drives, car boot sales, concerts and yearly harvest homes (a supper and dance to celebrate the successful ingathering of the harvest). 3.6 The three parishes boast many treasures – the St Magnus Church and the Earl’s Palace, the nearby Viking settlement on the Brough of Birsay and in Sandwick , the world-famous Stone Age village of Skara Brae which with the nearby Ring of Brodgar, the Standing Stones of Stenness and Maeshowe burial chamber form a remarkable and much-visited World Heritage Site. In Harray, there is the fascinating Corrigall Farm Museum, complemented in Birsay by the Kirbister Farm Museum. There is a wide variety of bird life for the keen ornithologist to enjoy and many wild and rugged walks past wonderful cliff scenery or in the quiet hills. The Bay of Skaill and the Brough of Birsay have wonderful sandy beaches. Fishing on the various freshwater lochs is free and enjoys an enviable reputation among anglers who come from far and wide. 4.1 The construction of the new, architect-designed Manse was completed in May 2000. 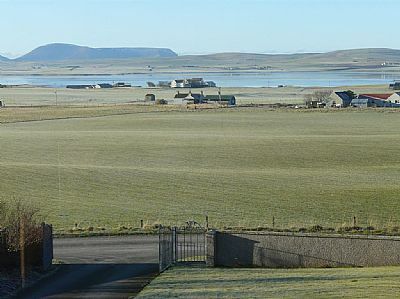 It has an outstanding outlook southwards over the West Mainland with the Hoy hills in the distance. It is situated half-a-mile off the main road and is one mile from Dounby, with a half-acre walled garden largely laid down to grass but with shrub hedges and some perennial, herbaceous borders and a small vegetable patch. 4.2 The accommodation consists of, on the ground floor an entrance vestibule, a study, a meeting room and a toilet and on the mezzanine floor the master bedroom with en suite bathroom together with three other bedrooms and a bathroom. The main living accommodation, consisting of a kitchen / dining room and a living room, is on the top floor where the views are stunning. The mezzanine and top floors are centred on a large stair well. There is an integral garage on the ground floor with a connecting utility room to the rest of the house. There are two integral external sheds / stores, in addition to several storage cupboards in the house. 4.3 All white goods are provided, together with a “sit-on” lawnmower for cutting the extensive grass areas in the garden. There are two “green cones” for disposing of organic waste. 4.4 The central heating is oil-fired, serving the hot water tank and numerous radiators in all rooms. There are several telephone sockets and numerous electrical sockets throughout. There is an electric oven and a calor gas hob. 4.5 There are six other houses in the vicinity of the Manse, well spaced apart in a “ribbon” development. The large stock farm of North Bigging is situated further up the road. The overall ambience is that of a house in the heart of a rural, farming community.